You’ve done the hard work and have a thriving business – what next? If you haven’t planned it already, it’s time you thought about how you exit and make some money for all that effort. Here are 4 key exit strategies to think about. 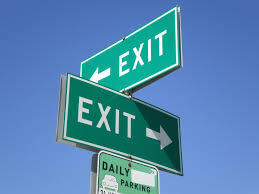 This is the usual exit for a professional services firm where the existing partners buyout the retiring/exiting partner. It can be easier than trying to sell the business to an external buyer but it may also involve you being involved with the business for some time after the sale and receiving your payout over an agreed period of time. If you’re thinking of selling the business to family, it can be fraught with difficulties and you will have to plan far ahead before you exit. The last thing you want is to see family members falling out over shareholdings and ruining the business in the process. This will take time and cost professional fees with advisers and brokers who ‘prepare’ your business for sale and drum up potential external buyers. It may get you the best price for your business but valuing a business can be tricky and there are no hard rules so negotiation is critical. Make sure you get more than one valuation and ensure you can get the cash up front without too many conditions on how the business performs after the sale. This could be the cleanest way of exiting the business and enjoying that hard earned money. However, it takes time to find a buyer and there can also be aborted deals. So costs can rack up pretty fast. If you keep in touch with your competition, why not sound them out about buying your business? It’s a very good reason to keep track of your competitors and being on friendly terms with them. An initial public offering (IPO) is really for the big boys and businesses or where a product or service has really taken off or where it is expected to. Selling shares even in the junior markets such as the London AIM is not for the faint hearted and takes a lot of planning and incurs huge costs. These costs can run up to several hundreds of thousands – yes £200k-£300k is normal. There will be a whole bunch of advisers that pore over your financials, prepare information memorandums to entice investors and hold your hand through the process. It also means that you will have to be involved with the business for some time before you can exercise your sale of shares and exit. After all, investors put in money expecting that you will manage the business and earn them more. IPO is a really long term exit strategy and has to be planned well in advance. If you’re running a lifestyle business or a small business that no would be interested in buying, just run it dry – take increasing salaries and or dividends to the point you want to stop but make sure there is sufficient cash to pay creditors and wind up the business. Of course, you will have higher tax liabilities but with good advice should be able to minimise it. Exiting your business is not easy but planning way ahead will ease the process. Financial discipline is key and having clean financial statements and even getting these audited for 3 years before exiting will help increase the business valuation. I would also recommend is that you get a good accountant long before you want to exit and plan with them on how you should exit. It will be one of the best investments you make!